1. Introduction: What Is Satisfaction? 11. 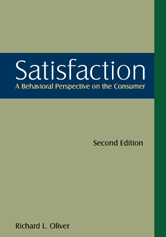 Attribution in the Satisfaction Response: Why Did It Happen? PART IV. SATISFACTION’S CONSEQUENCES: WHAT HAPPENS NEXT?